Save the date for GiveNOLA Day - May 5th! Now in its second year, this city-wide day of giving makes a significant impact on NOLA charities and causes. 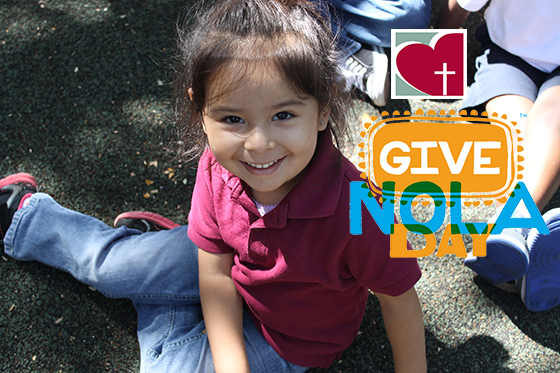 This year, GiveNOLA Day donations to Catholic Charities Archdiocese of New Orleans will benefit Head Start! Our goal is to raise $25,000 to support the 400+ children and families served by our five Head Start sites throughout the Greater New Orleans Area. Please SAVE THE DATE and mark your calendars to make a difference for the children and families served by Catholic Charities’ Head Start program this May 5th! Catholic Charities joined the nation in celebrating National Volunteer Week April 12 – 18. Last year, 12,412 volunteers gave over 200,000 hours of service across our many programs! Our volunteers are our cheerleaders, our best ambassadors and indispensable partners in service! 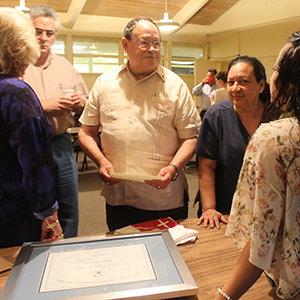 We kicked off Volunteer Week by honoring Danilo Perojo who has given over 4,000 hours of service, earning him the President’s Lifetime Achievement Award for National Service. Read more about how Danilo brings hope and help to the people who come to our Immigration and Refugee Services each day. On April 16, Catholic Charities Archdiocese of New Orleans joined with faith leaders in our community to advocate for justice and compassion for immigrants at an Inter-faith Prayer Vigil on the steps of the 5th U.S. Circuit Court of Appeals in advance of the appellate court’s hearing of oral arguments concerning the president’s executive order for Administrative Relief. We continue to work and pray to support legislation that respects the dignity of the individual and the preservation of the family. Parishes and Schools Share the Love! This spring, Catholic Charities has been blessed once again by the enthusiastic support of the many parishes of the Archdiocese of New Orleans in the 2015 Second Collection for Catholic Charities. The collection was held at Masses the weekend of February 28 and March 1. As of Monday, April 20, we have received the gifts of 92 parishes that have responded to the call to assist the vulnerable and needy! In addition, 34 Catholic schools participated in Show Your Heart Day this year - dollar by dollar, our students have shown that they have really taken the mission of Catholic Charities to heart! We are still receiving funds from our parishes and will keep you updated on the final total! THANK YOU to each and every person who gave in this year’s Second Collection. We could not continue serving so many without the support and assistance of the many caring and giving people like you! Calling all High School Students! How will you SERVE this summer? Registration is open for SERVE Summer Volunteer Program! Students can sign up for 20-40 hours of volunteering at various sites throughout the archdiocese including Head Starts, Ozanam Inn and summer youth camps. Volunteer sessions culminate with a day of reflection and fun where students connect their volunteer experiences to ways they can continue to make a difference in their own communities.